The day was July 31, 1981. It was a date that was, at the same time, a cause of elation and embarrassment. Let me explain exactly what happened and why I literally ran over to Morihiro Saito Sensei’s house to show him what I discovered and sheepishly apologize for my amateurish behavior. In the early phase of my long association with Morihiro Saito Sensei which started in 1977, I doubted that his aikido was closely rooted in O-Sensei’s teachings because of the apparent differences in the way these two masters performed their techniques. Moreover, I managed to communicate to Saito Sensei my skepticism about the “authenticity” of Iwama Aikido even though my Japan speaking ability at that stage was rather limited. To his credit, Sensei was very amused by my pronouncements and simply laughed at me. In retrospect, this was very rude on my part and served as a good lesson as will soon be apparent. How did I come to such a conclusion? My reasoning was based on extensive viewing of Morihei Ueshiba’s demonstrations in films from his final years where he performed relatively few techniques, many of them involving big, flowing movements with little contact with his uke. In contrast, Saito Sensei’s aikido was precise, martial and technically diverse. I was forced to reevaluate my opinion on this key point following the discovery of O-Sensei’s 1938 technical manual “Budo” where photos of several key basic techniques are virtually identical to the aikido forms taught by Saito Sensei in Iwama. Here is what happened next and how I was disabused of my erroneous belief. 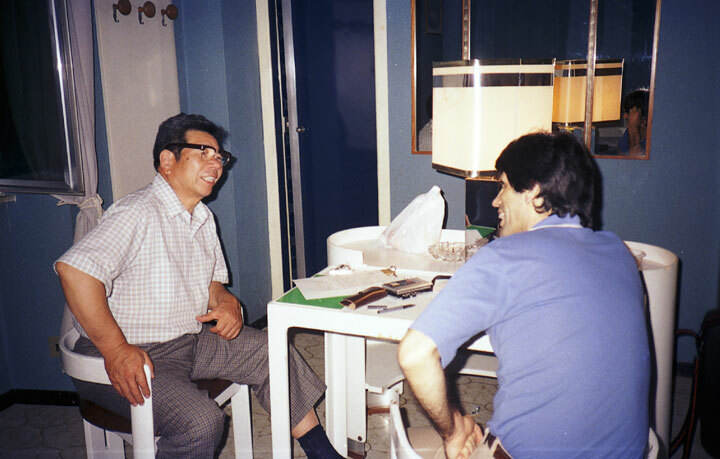 One day in July 1981, I was conducting an interview with Zenzaburo Akazawa, a prewar uchideshi of Morihei Ueshiba from the Kobukan Dojo period. Mr. Akazawa proceeded to show me a technical manual published in 1938 titled Budo which I had never seen before. It contained photos of some fifty techniques demonstrated by the founder himself. As I slowly turned the pages of the manual, I was amazed to see in the photos that the execution of several basics techniques such as ikkyo, iriminage and shihonage were virtually identical to what I had learned in Iwama under Saito Sensei. Here was the founder himself demonstrating what I had up until then regarded as “Iwama-style” techniques. Mr. Akazawa, who lives only a few blocks away from the Iwama Dojo, kindly lent me the book and I hurried to show it to Saito Sensei. I’ll always remember the scene as I called at Sensei’s door to share with him my new discovery. To my surprise, he had never seen or heard mention of the book before. He put on his reading glasses and leafed through the manual, his eyes scanning the technical sequences intently. I felt compelled then and there to apologize to him for having ever doubted his assertion that he was making every effort to faithfully preserve the founder’s techniques. Saito Sensei laughed and, obviously with great pleasure, bellowed, “See, Pranin, I told you so!” From that time on up through the end of his life, Saito Sensei always had along his copy of Budo in the Iwama Dojo and on his travels to use as proof to show that a particular technique originated in the founder’s teachings. In his foreword to Takemusu Aikido Special Edition: Commentary on Morihei Ueshiba’s 1938 Technical Manual, Saito Sensei recalls the episode and describes the importance of the discovery of Budo as a validation of his teaching methods. I still remember vividly how ecstatic I was when Stanley Pranin first showed me the book titled Budo written by the Founder Morihei Ueshiba. I felt convinced that this book was the only document that could validate my aikido and that the founder had come to assist me. I hoped it wasn’t just a dream. Around that time, there were those who referred to my aikido as “Saito-ryu aikido.” I wanted to answer them saying that it wasn’t true and that my aikido is “Ueshiba Morihei-ryu.” It was very difficult to restrain myself. 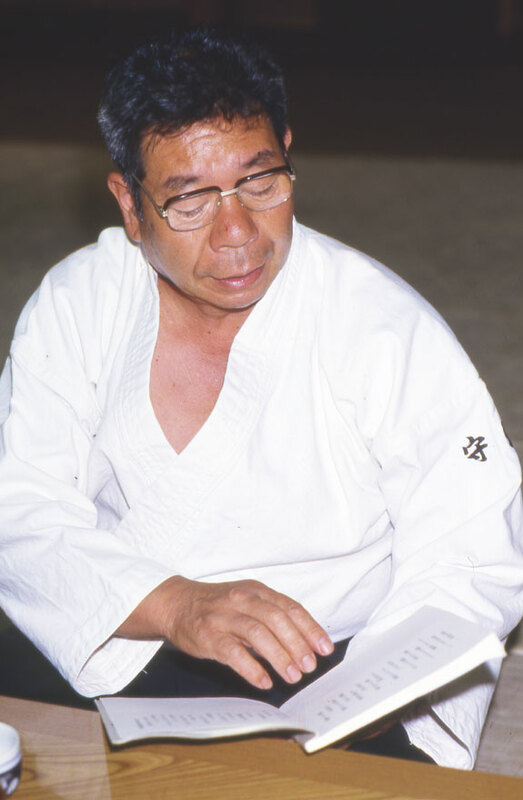 In the early 1960s, even though the Founder was still enjoying good health, he did not teach weapons or basic taijutsu techniques anywhere other than Iwama. His teaching elsewhere consisted mainly of demonstration-like performances with little explanation. This is why my aikido was misunderstood as I have mentioned above. Since I discovered Budo, I have always kept it at hand wherever I have gone. I think I was given the mission of introducing the Founder’s techniques to as many people as possible because I am entrusted with his dojo. Fortunately, the techniques I learned directly from the Founder over many years are nearly the same as the basics presented in Budo. For this reason, I was delighted to accept the invitation to demonstrate and explain the techniques of Budo for the next book in my technical series Takemusu Aikido published by Aiki News. Aikido is a martial art created by the Founder Morihei Ueshiba. I will be very pleased if this book can provide a helpful reference for those who believe that the Founder’s basic techniques should be the starting point for their practice of aikido. This long-neglected little book stands as irrefutable evidence of Morihei Ueshiba’s art in the late 1930s and into his Iwama years during and after World War II. O-Sensei’s aikido was quite different in nature to what became the mainstream aikido that was spread to the general public in the 1950s and 60s and is still widely practiced today. 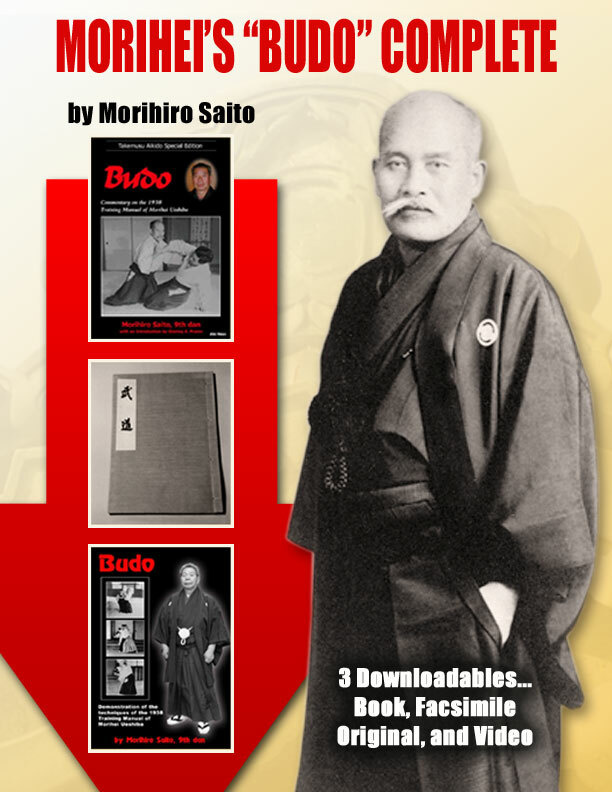 Aikido Journal has created a definitive set of 3 downloadable source materials that thoroughly document Morihei Ueshiba’s 1938 Training Manual titled “Budo.” This set includes (1) Morihiro Saito’s 43-minute video recreating all of the 50 techniques of “Budo” in high resolution, (2) Saito Sensei’s illustrated textbook titled “Budo: Commentary on Morihei Ueshiba’s 1938 Training Manual” in PDF format, and (3) a PDF facsimilie copy of the original Japanese book. Readers will be able to access their downloadable products within minutes of purchase. No more paying for shipping, no more customs charges, or lost packages, no more waiting! This special offer is available only through Sunday, December 9, for the special price of $24.95.